Ministers have launched a £2m fund to encourage public services and businesses to switch to hydrogen-fuelled vehicles. The Fuel Cell Electric Vehicle (FCEV) Fleet Support Scheme will help councils, health and emergency services and private companies buy hydrogen-powered vehicles with up to 75% of the purchase price and running costs for up to three years. Support will also be available for the leasing or renting of vehicles, insurance, hydrogen fuel and servicing. 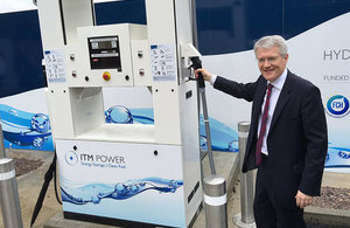 The scheme was launched as transport minister, Andrew Jones, opened the second of 12 hydrogen refuelling stations under the Government’s £5m Hydrogen for Transport Advancement Programme. The Department for Transport (DfT) said all 12 stations are expected to be open by the end of the year, representing ‘a significant step towards a national network’ of 65 stations. The DfT said the new £2m fund, launched by its Office for Low Emission Vehicles (OLEV), could bring up to 100 more hydrogen fuel cell cars and vans onto Britain's roads by next spring, which would triple the number currently in use. It admits that the market for hydrogen FCEVs is small and only ‘slowly gathering pace’. Vehicle manufacturers have so far introduced a small number of models and global production is limited to just a few thousand units. FCEVs emit no CO2 or other harmful pollutants and offer a driving range of more than 300 miles. They can be refuelled in five minutes using a hydrogen gas pump, similar to petrol pumps. Bids for the FCEV Fleet Support Scheme must be submitted by 4 July.